uRun: [RocketDock] "C:\Program Files (x86)\RocketDock\RocketDock.exe"
Before we proceed further, please uninstall or disable uTorrent and any other peer-to-peer filesharing app. Continued use of filesharing or ill-advised downloads will surely re-infect your system. There's a possibility that you'll lose your internet connections which I may not be able to correct and will require a repair install. [*]It will make a log (FRST.txt) on the flash drive. Please copy and paste it to your reply. I'm trying to disable Tea Timer from Spybot&Search, but this program wants me to run it on admin; however, when I click on right click I get this pop up Windows Installer installing and then my bottom tab..the start up menu freezes. I haven't tried that..I was just making sure that I'm following the instructions. I know it said *may interfere...Let me run ComboFix now.. Detected none...I hope. When I click on a file, this windows installer shows up and just freezes my desktop. My mouse icon is on loading animation. But yea, my desktop is frozen right now. My desktop freezes when I right click on a file..this windows installer shows up and nothing happens. Yup, a lot of times. Should I do system restore, but would that bring back those nasty trojans? I found out that I can buy a recovery disc from HP store that will recover it to factory settings. Thank you very much for helping me out, MrC!! 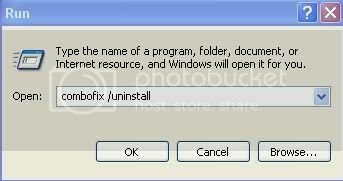 Press the Windows logo key + R to bring up the "run box"
Any other programs or logs you can manually delete. If you think I've helped you, please leave a comment > click on my avatar picture > click Profile Feed.